Yeah, I know... The text is too small. Just view the full size. So I guess I'm making us (atheists) look bad... I know 100% that there is no God1. Much in the same way I know square circles can't exist: it's a confliction of terms. For example God can't be all powerful AND benevolent2, because the world we live in is not a perfect one3. You don't need absolute knowledge of the universe to figure that out. 1: "God" as defined by the major religions, anyway. 2: Of course I'd say the God of the Bible is malevolent and even if He did exist He does not deserve our praise. 3: Don't you dare use the "free will" argument. Not all imperfection stems from human will; earthquakes, illness, and aging for example. Mankind's free will is physically limited anyway. It does seem that this figure leaves out a lot of possibilities, such as the overlap between atheism and Christianity and the three way atheist-agnostic-religious overlap. The first is common in a lot of mainline pastors who are certain that God doesn't exist (except as a metaphor) and doesn't affect our lives, but are equally convinced that we need to be religious. Both explicit atheism and theism are extremists claiming what they want to believe or intuitively believe. Neither have scientific truth, that I'm aware of. @ Looney: That sounds very hypocritical... But hypocrites are common amongst the religions, so you're right. I've never really considered agnostic atheists/theists to really be atheists/theists. I mean, if they're not really sure, I just call them agnostic. Hi Marf - thats a great Venn diagram and does a good job of pointing out the different camps that people get into. I always know a picture/cartoon like this is good when I wish in my bones that I had come up with it! 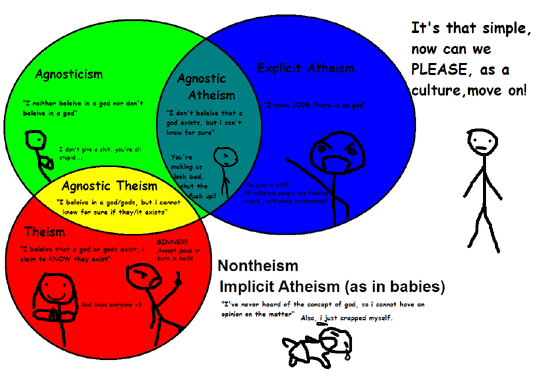 Personally on your diagram I am probably on the boderline between agnostic atheism and explicit atheism. Im not as intolerant as some of the more strident atheists as im prepared to accept that religions have made some positive contributions to our cultural development. To be honest had I not come across strident theists and fundamentalists I would probably still be a quiet "backroom" atheist - but like many many other atheists I decided it's time we came out of the shadows and spoke up for a different way of thinking about the world. And it does make for some great heated internet debates. @ Bunc: I too, have to agree religion has made some positive contributions. But just like a baby's pacifier or a child's security blanket, there comes a time when society matures enough that religion becomes a burden. With modern science, that time has come. Deism is the fine line between atheism and theism I think. @ Anonymous (#7): There's always some gray line that doesn't really fit in anywhere... What about the nature religions that don't have a "God" per say?